U.N. Report: Humanitarian Needs Will Remain 'Extremely High' In 2019 : Goats and Soda An annual report from the U.N. humanitarian agency looks at the challenges ahead. 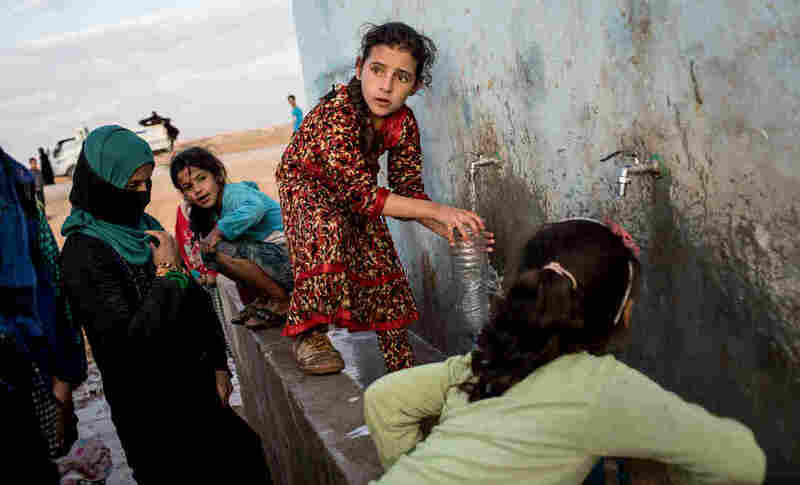 Access to water is increasingly entangled with conflict situations. (Above) A young girl fills a bottle at a pump station at a camp for internally displaced people in Ain Issa, Syria. It's quite clear that 2018 was a tough year for the world's humanitarian agencies. They tried to provide help to the victims of ongoing conflicts in Syria, Yemen and Somalia, to name a few hot spots. And then there were major disasters like the floods in India and the tsunami and earthquakes in Indonesia. Indeed, there's no end in sight to many of the crises. "There's been limited progress in addressing the root causes," said Mark Lowcock, head of UNOCHA, at the report's launch event in Geneva. That's because the root causes are increasingly a messy mix of conflict, climate shocks, poverty and social inequalities. Here are five insights from the report that will help shape humanitarian response efforts in the coming year. The figures are from 2017, the most recent year for which the agency has complete data. Humanitarian resources must be stretched even further for more and longer-lasting crises. Since 2005, the number of active crises with internationally led responses has nearly doubled from 16 to 30 in 2017. On average, crises have also almost doubled in length from four to seven years. Funding appeals have also more than tripled from $7 billion in 2008 to $24 billion in 2017, although only 60 percent of the 2017 appeals were funded. More than 80 percent of the funding required that year was for just eight "mega-crises," as the report calls them, that have lasted five years or more, in Democratic Republic of the Congo, Iraq, Nigeria, Somalia, South Sudan, Sudan, Syria and Yemen. Traditional disaster response isn't cut out for long crises. Humanitarian responses are not designed to be sustained over a long period of time. The aim is to save lives and address the human impact of emergencies. Development efforts, on the other hand, address long-term issues like poverty and health, as well as building resilience and stability. As humanitarian crises drag on in the absence of political solutions, that distinction is beginning to blur. For example, refugees are remaining in camps longer, making it very costly to provide for them. So humanitarian organizations are now looking at ways to help refugees become self-reliant, to generate income for themselves and enter job markets outside the camps. The report calls for increased coordination and cooperation between humanitarian and development agencies. This includes sharing knowledge as well as helping each other make the transition between their work more seamless: "This is an important question for the future: Can the transition between humanitarian and development work — or vice versa — be made easier?" says Birthe Anders, a senior fellow at the Harvard Humanitarian Initiative. It's becoming more dangerous to be an aid worker. In 2017, health care workers were the victims of more than 700 targeted attacks, including attacks on health facilities and transportation. In response, some humanitarian agencies scaled down operations, leaving many people without access to health services. "Yes, humanitarian aid workers accept a higher level of risk than many other professions, but at a certain point they have to consider where to draw the line in order to protect not only themselves, but also beneficiaries if, for example, health care facilities are being attacked," says Anders. Pronounced swings in seasonal water supplies are threatening stability in some areas. The question of who controls natural water resources and water systems was a major trigger of conflicts in 45 countries, mainly in the Middle East and North Africa. In many cases, people lost their supply of water. And in some conflicts, cutting off access to water was used as a weapon. For example, the report found that in Yemen there were 28 conflict events in 2017 in which water set off fighting or was a casualty of hostilities. Tribal disputes have escalated to violence over water access, and airstrikes have destroyed water systems that provide drinking water for thousands, according to news reports. In Syria, armed groups have deliberately cut off people from water to weaken them. So supplying water for drinking, sanitation and farming is more important than ever. And humanitarian organizations and global leaders can identify hot spots based on issues involving water supply. Technology is improving the quality of aid. "It's not all doom and gloom," says Lilian Barajas, managing editor of the report. Even though the cost of humanitarian assistance has increased, people are getting higher quality and better aid, she notes. A large reason for this, she says, is because "the humanitarian community is also getting better at incorporating new technologies into our work." These technologies include using mobile phones to disburse cash transfers or conduct real-time surveys as the World Food Programme has done for nutrition data. Humanitarian organizations are also using artificial intelligence to track displacement within country borders in real time. Internal displacement is notoriously under-reported, leaving many without the aid they need. AI can gather and sort through news of displacement from massive global data sets, including social media, so that responders know exactly where to deliver aid.